Dear Mother/ | carpe diem! I regret that I have been unable to reply to your letter/telephone message expressing concern/angry email/plaintive meow. I was exploring space-time with Dr Who/paralysed from the neck down by sudden illness/isolated from the rest of the world by a total electricity failure/desperately trying to finish knitting a shawl. I hope to send a response to your query/those proofs/that print job/clean the litterbox and placate you with gooshy food in the very near future. Three rows and the bind-off to go. Fortunately? my husband knows the score. He didn’t even try to talk to me last night. 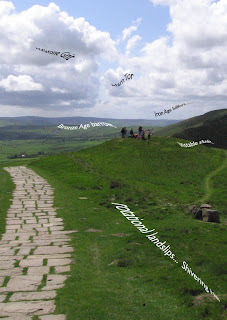 On Saturday we again drove up to the Peak District to prove? test? our fitness. Debby, competitiveness can be a good thing if the body is up for it. In our case(s), the spirit is willing, but the flesh (more specifically the joints) are weak. He’s had an arthroscopy on one knee and the other’s just as bad; mine aren’t much better after decades of abuse. If we attack one hill flat out, we might not be able to get back to the car, let alone up the next hill! I was thrilled by the thought of pure unadulterated ‘knitting time’ during the drive, so took the Purple Thing. Car-knitting proved less ideal than I’d thought, even the motorway has rough bits and distractions. I’ve had to pick up some dropped stitches, which left some tension anomalies (one is visible in the photo). Never mind, they’ll remind me of another place this shawl has been. I’d intended to leave the shawl in the boot/trunk of the car (obviously any thief worth its salt would have stolen it if I’d left it in plain sight) at Winnat’s Pass but found I couldn’t. I just couldn’t. Suppose someone stole the car? They’d have my shawl. The insurance value would be derisory by comparison to the hours of my life it embodies. It’s FAR more valuable than the car. Despite having spent quite a lot of money on lightweight walking gear I disregarded the noticeable weight of the stitch markers and stuffed it into my pack. My explanation of the value of the shawl vs that of the car met with some amusement. It was a good day out. In weather ranging from hot sun to horizontal rain and hail we climbed Mam Tor, walked the Great Ridge to Lose Hill, then turned around and walked back and further, along Rushup Edge to Lord’s Seat and beyond. About 14.5km in total, less than last time, but much more upanddown. My knees are still complaining. I find everyone’s different hair stories intriguing. Even while I wish I’d had the courage to disregard my parents and cut my hair as a teenager, I try to imagine wanting long hair. Diversity is the spice of life. One of the spices of life. There are so many, we just have to recognise them. Work, I must work. How else can I earn money for the sock monkey? DON’T ANSWER THAT! This entry was posted in Uncategorized on May 21, 2007 by sarahw. You are so clever / talented / amusing! That is all. It all looks beautiful, doesn’t a walk like that blow some cobwebs away? Know what you mean about the knees though, some mornings I must look like I’m doing a Marx Bros impression as I walk across the bedroom! 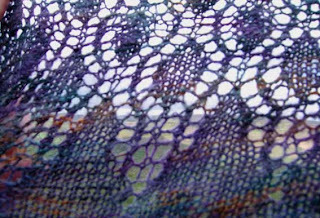 I’m cheering you on to the finish line for the shawl, sending good knitting karma. Oh, and as for the sheep, they look really fluffy but when you reach out to touch, some are so full of lanolin (sp?) it doesn’t move at all, good for the hands though! Sarah,I didn’t realize you and your husband had knee trouble — definitely not worth risking injury with those!Your hikes sound amazing. I love the lily of the valley photo in the previous post. We have a patch of them by our front door and the scent is out of this world.